Casstown firefighter Rick Knife, wearing a nametag of a fallen New York City fireman, makes his way to the top of Troy Memorial Stadium during the 1st Freedom Climb in 2017. MIAMI COUNTY — The second annual Freedom Climb is set for Sunday, Sept. 9 at Troy Memorial Stadium. This event honors and remembers the FDNY Firefighters, NYC Police and EMS who gave their lives on September 11, 2001. By climbing the equivalent of the 110 stories which make up the World Trade Center Towers, at Troy Memorial Stadium, participants honor and remember the sacrifice of the 343 Firefighters, 60 NYPD and 10 EMS lives who died in the attack. Opening ceremonies will begin at 1:45 p.m. with Honor Guards from the Troy Fire Department and F.O.P. Lodge 58 who will post the colors, followed by the National Anthem. Troy Mayor Michael Beamish will lead the prayer along with Miami County Commissioner Greg Simmons. 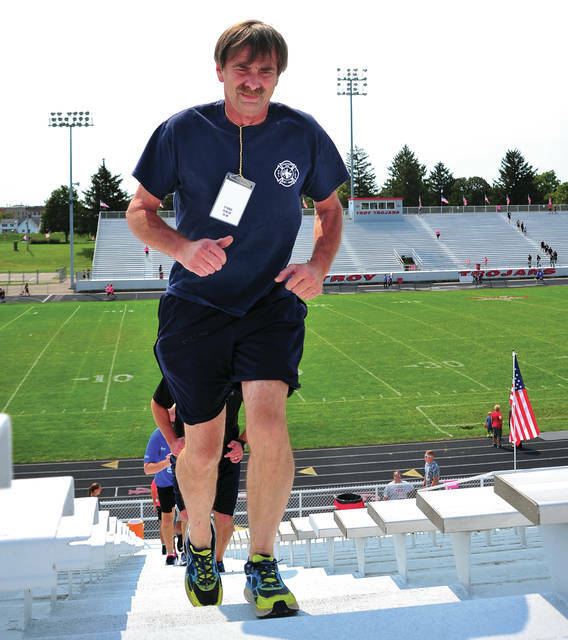 Beginning at 2 p.m., participants will climb the stairs at the Troy Memorial Stadium 64 times, which is the equivalent of the 1,980 steps that made up the 110 story height of the Twin Towers. Participants also have the ability to achieve the same goal by completing four laps around the stadium track. There will be separate donations for Jason Holfinger, the Troy Firefighter who passed away unexpectedly this year. All donations will be presented to his wife and three children. All donors will be given the opportunity via random drawing to receive one of eight specialized American Flags to thank them for their generosity to the community. The Honor Guard will close the ceremony by removing the colors at 4 p.m.
Members from Kettering Health Network will be on-site in case of any injuries. This event would not be possible without the generous donations and support of the following:Miami Acres Animal Hospital, Optimist International, Mercer Group, Harren’s Market, Abbey Credit Union, Troy Board of Education, Kettering Health, Troy City Schools, Anytime Fitness, Can’t Stop Running, StoryPoint and Staples. https://www.dailycall.com/wp-content/uploads/sites/30/2018/08/web1_091017mju_troy_freedomclimb4-1.jpgCasstown firefighter Rick Knife, wearing a nametag of a fallen New York City fireman, makes his way to the top of Troy Memorial Stadium during the 1st Freedom Climb in 2017.